Garden incinerators & Fire Pits are proud to present the brilliant Homefire Shamada Heatlogs 1 X 12 Cm. With so many on offer these days, it is wise to have a brand you can recognise. The Homefire Shamada Heatlogs 1 X 12 Cm is certainly that and will be a excellent acquisition. For this great price, the Homefire Shamada Heatlogs 1 X 12 Cm comes highly respected and is always a popular choice for many people. Homefire have included some nice touches and this results in great value for money. 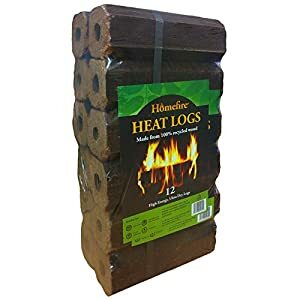 Heat Logs are manufactured from 100% recycled waste wood, and can be considered as a carbon neutral fuel, as the wood they're made from would otherwise have been sent to a landfill site, where it would eventually be broken down into methane gas which is 4 times more harmful to the environment than Carbon Dioxide. Please Note: Not authorised for use in smoke control areas unless burnt on a DEFRA exempt appliance.